A mooring is a way to hold an object, such as a boat or an instrument, in one place in the water. 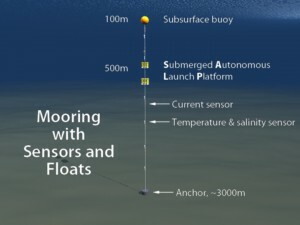 A deep-sea mooring is similar to a mooring that keeps a boat anchored in a harbor—it has a heavy weight that sits on the bottom to keep it in one place, some rope or wire that stretches up from the weight to the top of the mooring, where there is a buoy or floating ball that acts like a balloon and keeps the rope upright.Instruments that will measure ocean currents, temperature and salinity (saltiness of the water) are securely attached to the upright wire. 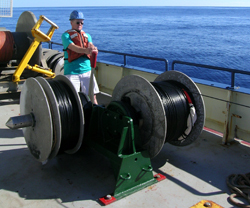 A Winch is a very strong mechanical device that is used to raise or lower heavy objects connected to a wire on or off a ship.A winch has a large drum or cylinder with thousands of meters of wire wrapped on it. A strong motor turns the drum one way to wind wire on to it, pulling the heavy object closer to the ship, and the other to unwind the wire, letting the object sink farther down in the ocean. A skilled operator controls the winch. 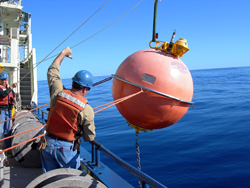 Subsurface Buoys are large strong balls that can float. 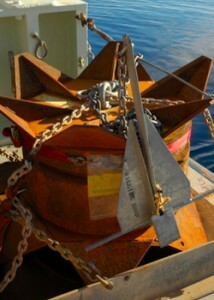 A buoy is attached to the top of the mooring, which is still far under the ocean’s surface. It tries to float to the surface but is held under by the anchor and the wire, making the wire stand up straight under the water. 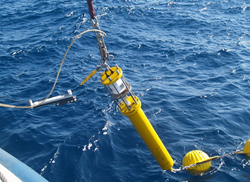 Microcat® is a “brand name” for an instrument that is attached to the mooring wire to measure the temperature and saltiness of the ocean water that is traveling past the mooring. Anchors are very heavy (2000 pounds) weights that sits on the ocean bottom and keeps the mooring from moving. 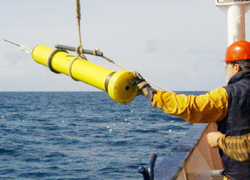 Profiling Floats are long tubes that contain sensors that measure the ocean’s temperature and salt content as they drift along in the water. The floats rise and sink hundreds of feet in the ocean, repeating the up-and-down pattern as they drift. This allows scientists to learn how the water is different along the path that the float travels. Every few days, a float will travel up to the water’s surface and send the measurements to a passing satellite. 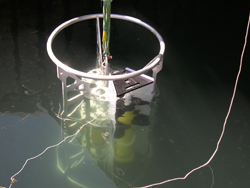 SALP is the acronym stands for a long scientific term, but this is is a computer-operated underwater cage or framework that is 6 feet wide and holds 6 “profiling floats” in metal clasps. We can program the SALP instrument to open the clasps under certain conditions and release the floats, one at a time, into the ocean. 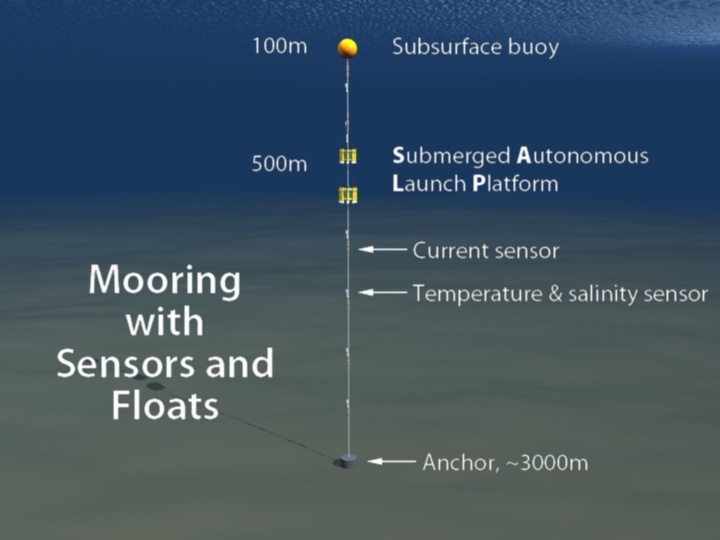 Current Meters are devices that are attached to the mooring wire to measure and record the speed and the direction of the ocean water that is traveling past the mooring. Like a pinwheel spinning in the wind, a current meter turns faster when the current of water flows faster.